Although in the running for Best Actor at the TVB Anniversary Awards for five years, Kenneth Ma (馬國明) failed to receive the award for his role in Lord of Shanghai <梟雄>. Many expressed sympathy for Kenneth, especially since it was Kenneth’s fifth time being nominated for the award. The closest that Kenneth came to winning was in 2012, when he was nominated for his well-received role in the popular drama, The Hippocratic Crush <On Call 36小時>, but he was unfortunately lost out to Wayne Lai (黎耀祥). 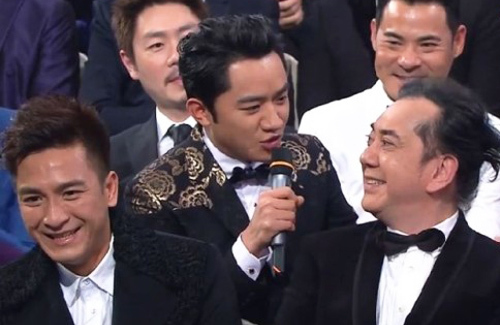 As Kenneth was nominated this year, but again lost, netizens dubbed him as “TVB Anniversary Awards Professional Sidekick”. However, some netizens pointed out that while Kenneth did not win TV King, he had received many valuable career opportunities which allowed him to film enviable intimate scenes with many A-list actresses. The netizens cited Kenneth’s scene with Alice Chan (陳煒兼) in Lord of Shanghai as an example. Kenneth may be comforted to know that he is not the only artiste who has been consistently nominated and failed to win. With a similar plight, Linda Chung (鍾嘉欣) has been nominated for TV Queen six years in a row but has failed to obtain the award each time. Some netizens pointed out that Linda’s acting is actually decent, but she has not received a role in which she could truly demonstrate her potential. Another netizen, in a tone that bore a mix of encouragement and mockery, commented that Ka Hung Wei (韋家雄) waited for 20 years before finally receiving his Best Supporting Actor award, implying that Linda still had time to wait. This article is written by Jingles for JayneStars.com. Indeed, Kenneth’s scenes with Alice Chan was one of the reasons why I continued watching LOS. In fact, it astonished me that he did really well in the drama. Not a fan of his but I was quite impressed. @nori Indeed! And let’s not forget about the love scenes between Kenneth and Elena Kong (江美儀 ) from Triumph in the Skies II!! I think he already knows he’s won that category! @purplexstraw the several kissing scenes between elena and kenneth were HOT! Agreed, I haven’t seen much improvement from her acting outside of her goody-good character. Can never forget her stiff-face in Tiger Cubs II. Will possibly haunt me for life. Watched 3 eps then dropped it for good. @anon And yet, did you see her facial expressions when she found out she didn’t win (again)? Aw, her “good” crying scenes in dramas can only get her so far. She needs to be more diverse with her acting. I didn’t watch the award show. @mike How did she able to get an award from China, really befuddled me. And Bosco too. What kinda award that they could win against sea of talented actor and actress from China? @mike how decent is linda’s acting? is so boring. her role in Limelight Years was also boring. Wei Ka Hung is voted to be most deserving winner. He didnt lose 20 years ineffectively. Audience recognize him. The above two arent the most nominated artists in TVB without winning. They only has 5 or 6 years. Still can wait if they wanna wait. If not, leave TVB. @alluka The article says 5 and 6 years of nominations and those two still didn’t win. Wei Ka Hung didn’t get nominated 20 consecutive years and not win it. If he got nominated 20 consec years and not win, he would be 1st line actor by now. @mike Two different paragraphs referred to two different things. First paragraph: Wei Ka Hung has been nominated few times without winning. He is in TVB for 20 years to act without being recognized until now. Second paragraph: There are artists with more nominations, more experiences and stayed in TVB longer than 5,6 years of the above two. They havent won. So the above two are not the most nominated without winning, which mean they can wait. Or choose to leave, if like. Their cases are not rare. How long do they in TVB? Ma Ming: 15 years, Linda: 10 years. And they are already nominated for 5, 6 years. It shows how they are promoted. Not a fan of Linda after meting her, but not hating her either. …she just cannot express the emotions in her roles. @alien She was very poor in Tiger Cubs 2. It was painful to watch her attempt a new role and fail so bad at it. Ku Ming Wah also waited very long to win the award. All these years Linda was not given any extraordinary role to act, these are reasons why she missed getting the awards. I feel Alice Chan has the potential, she can be compared with sharen tang, she should be given more opportunities to showcase her acting. The void left by sheren tang should be given to her. I hope the producers should try on her like how they try on Wayne Lai, of course with good scripts. @titi Read the above comments about her in other roles. She had her opportunity for different roles but she was pretty bad at it. ie. Tiger Cubs 2. It was a totally different role than her normal crying baby girl roles and she failed miserably. @mike It’s certainly strange. Linda started out with great potential. Virtues of Harmony, Heart of Greed, the Gem of Life, a Journey called Life… and then it went downhill in the recent years with her worst performance (imo) being in Brother’s Keeper, All that Bitter is Sweet and Tiger Cubs. I was glad to see Linda in Limelight Years as it took her out of the stereotypical good girl image, but even that was bad. I wish to see the old Linda who acted naturally before. The current her is definitely not a Best Actress material. @mike actually it is quite true she wasn’t given good roles, chung Wai Yan was a miscast, even Charmaine had a bad miscast as Fah Che. Why wasn’t Linda given the role of deng che (line walker) or CHANG Kai Ying (bk)? She’s been typecasted due to her sweet demeanor. Likewise It’s impossible for Kristal to play Rachel so she’ll cont to get roles like CHANG Kai ying whereas Linda will con’t to get roles like Rachel. @genxx11 Haha, if Linda was cast in Line Walker, oh my it would turn out like Tiger Cubs 2…I would rather she not take such roles. @mike probably her squeaky voice that failed her everytime. I think her acting was best when she collaborate with Johnson to prank on the magician. Over 10 years at TVB, Linda has been given many good roles to stand above from the rest and have a breakthrough with their characters. Given the length of time and the number of opportunities, Linda couldn’t seize the opportunities. If she can’t do it by now, she’s likely never will. IMO, the only reason why KM has been nominated all these years is because they freaking nominated every lead in every series every year xD He is still better than the new crop. However, if he doesn’t show improvement, I won’t be surprise the new crop surpasses him fairly soon in both acting skills and promo from TVB. @jjwong You took the words right out of my mouth! Aside from the above-mentioned, there were also those years in the past when TVB would do the Top 10 thing and nominate artists in the TV King and Queen categories who don’t belong there (and snub artists who SHOULD be there). In other words, since TVB can manipulate the nominations list at their whim and change the criteria whenever they want, there’s no consistency so it’s not an accurate gauge in my opinion. Another meaningless article from on.cc….must be a slow news day. kenneth’s acting is better than before but not at the level of tv king. i think ruco has a better chance than anyone else to get it the first time. I got a feeling that hes going to leave after his contract end. Like as if he had a chance. @funnlim Ikr. I like kenneth as a person but tv king. …..? It is indeed burnnnn when you’ve been given hope 5-6 years and then not get anything. Furthermore, Linda has always been given leading roles since day the beginning of her acting career and Nancy was only given co-leading roles the last two years, yet she won before Linda. Linda’s role in Limelight wasn’t that bad and not her typical goody girl either. She had a fair chance along with Nancy, but I guess the series aired too early in the year that everyone forgot about it. Nancy also had her co-star, Kristal whom she had really good chemistry with that made her role more memorable. @ladykriselle I can’t help but laugh at them for putting on a fake smile in front of the camera. Just by their facial expressions, you can tell Ruco and Liza are really obsessed with winning the TV King and Queen award. @unknown liza wang must be very sore she lost the TV Queen award while anthony wong can win tv king. i am also disappointed ruco lost it. @janet72 I don’t get it, why are awards so important to them. Why do some actors become so obsessed with winning an award? @unknown because recognition via this award could mean ability to demand more money? @ladykriselle yes, Linda had a fair chance this year, her role in limelight years is well liked by the viewers, tvb could have easily given her the award but instead they chose to make exception for Grace and created a public outcry. @genxx11 Linda has never been popular amongst other tvb actresses. you can tell which actress don’t like which at the awards show. @mike there are cliques among the actresses, Nancy, Elaine, Selena, Mandy are all in Myolies group that’s why they are so close whereas Linda is in the Christian, English speaking, overseas Chinese group where she’s the only first line actress. Tavia is not in Myolies group that’s why she and Linda are sticking together. @genxx11 haha, maybe they only stick around during interviews and picture. Was at the airport when Tavia was walking out with another actress and Linda was walking out alone at the back. Linda should leave for China as soon as her contract expires, she already got the most popular female actress in mainland award (which to me is much more valuable than tvb’s best actress), I foresee her popularity to soar next year with the nezha drama while Kristal, Nancy will continue to dominate in Hong Kong with strong drama lineups. I can totally see Linda in the league of liu Shi Shi and yang mi but not Kristal and Nancy, not even Charmaine and Myolie. @genxx11 I doubt very much that Linda Chung will be as good and popular as Liu Si Si in Mainland China. Linda Chung’s acting is still too superficial and shallow …… no depth at all. She was almost the same in every single role. She was always Linda Chung to me, and not her characters. It is not easy to be popular in Mainland China. There are thousands of actresses, and a lot of them are trained. Linda Chung needs to improve her acting skills if she wants to move up in the entertainment industry. @orchid123 liu shi shi is not bad looking and her role in BBJX is good. doubt linda can achieve that. Linda Chung was given different roles but she just can’t give life to those characters. Even if she wants to go to the Mainland, there is no guarantee she will be given a chance. Quite tired of her cry baby roles too. @janet72 I was never a fan of Lind but I used to like her. Now I am really sick oof her. Agree with @orchid123 Linda Chung needs improvement in her acting; as for her look she is ok to me except her nose is a bit too big and distracting when looking at her from the front face making her more like a trans gender otherwise she might look more pretty. So much talk on Linda when the article is about Kenneth. I only liked him in On Call 36, he was not really a convincing actor, and most of his character were quite annoying. He has a lot more to improve, IMO. Linda might seem so sweet on television, but in real life she is not that friendly when I encountered her. But, that’s my individual opinion and does not reflect on her overall. linda is sweet…but she can’t act. tired of seeing her with cry baby roles but freaked out after watching her in Tiger Cubs.